Before we begin, I'd like to thank the editors for allowing me to host the carnival on December 5, the day which is considered by most right-thinking people the foremost holiday within a month of holidays; I refer of course to the annual Day of the Ninja. Can't stand to wear that wretched Christmas sweater again this year? You can make your own ninja mask from a black t-shirt! Are you still suffering from a repetitive stress injury from spinning the dreidel last Chanukah? You can make your own paper throwing star (Shuriken) in 22 easy steps! Do you enjoy the Festivus Airing of Grievances but hate having to speak to your relatives? If you follow the way of the Ninja, you can work out your grievances silently. But I digress . . . . Abandon all hope, ye who enter the thirty-fifth Blawg Review! "I will tell thee very briefly. 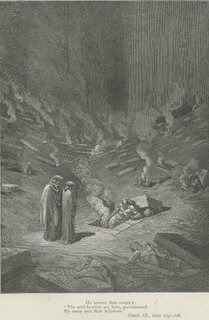 Much of the imagery and poetry in Inferno and in the other two canticles of The Divine Comedy, Purgatorio and Paradiso, is memorable, but nothing has remained with me more vividly than that concept of a hell unworthy of Hell filled with those who, as Dante observes, "made through cowardice the great refusal". 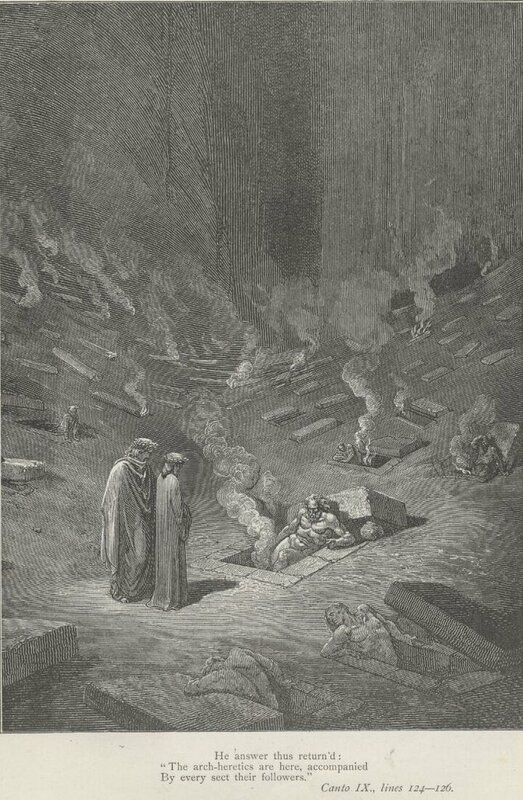 Few things can be more fundamental motivations than the desire to be of consequence; to be one of the inconsequential souls -- those whom Dante noted in passing as "[t]hese miscreants, who were never alive" -- is in many ways more damning than to exist in any of the nine circles of Hell through which Dante and Virgil subsequently journey. Low poems had happy endings and were of everyday or vulgar subjects, while High poems were for more serious matters. Dante was one of the first in the Middle Ages to write of a serious subject, the Redemption of man, in the low and vulgar language of Italian, not Latin as one might expect for such a serious topic. I cannot think of a better analogue to legal blogging! What are legal blogging generally and Blawg Review specifically if not the discussion of serious subjects in more accessible forums and in more accessible language? And so we begin . . . .
Ross Runkel, Professor Emeritus of Willamette University College of Law, founder of LawMemo, and your host's Labor Law professor during his Willamette days, announces that his Ross' Employment Law Blog will offer a series of approximately sixty short essays concerning various employment law topics; the series, titled "Employment Law 101", will be published Mondays, Wednesdays, and Fridays. Professor Runkel will discuss "hot topics like sexual harassment and genetic testing, plus some boring (yet crucial) topics like statutes of limitations and remedies." Our mothers always told us to remember to say the "magic word" when we ask for something; in a series of three posts, Sheryl Schelin of The Airport Lawyer reminds us of that and provides some additional sage advice for anyone seeking information from local government agencies under state Freedom of Information Acts (FOIAs). It may be worth your while; she writes, "I know there's a faddish tendency to mistrust "the government" - mistrust the government all you want, but don't lose sight of the fact that what you're really mistrusting is individual workers, and call me Anne Frank but I truly believe most of us are trying to do the right thing." Bruce MacEwen of the Adam Smith, Esq. blog passes along some words of wisdom from author Michael Lewis (Liar's Poker, The New New Thing, Moneyball) and offers some words of hope of his own concerning "what makes it all worthwhile". Lewis opines that, "As for happiness, it comes from thinking your job has a purpose. The scarcest resource in the world is purpose. People who have purpose, other than money or social position, tend to be much happier." Adam Smith of the Bruce MacEwen, Esq. blog disagrees and argues that money is everything. Appellate Law and Practice gives us its "Top Ten Worthless Pieces of Appellate Advice", including "Make your point clearly" and "Don't misstate the law"; fortunately for myself, I work in an in-house legal department, and so these are not requirements for me. Jim Calloway's Law Practice Tips Blog highlights a website devoted to the somewhat arcane topic of conflicts of interests rules. As Calloway points out, "If you've ever done legal research on ethical conflicts, then you know that once you get past the easy and obvious rules, the law becomes complex rather quickly." His recommended site is Freivogel on Conflicts. "Law Librarian/Info Diva" Connie Crosby took one for the team and attended the recent KM World and Intranets 2005 seminars so you didn't have to. Back at the end of October, Crosby warned us that she would be away at the conference but that she was "anticipating some good blogging from there"; she didn't disappoint -- what a virtuous pagan! Professor Lawrence Lessig provides an update (with helpful diagrams!) on efforts within Creative Commons to harmonize the legal effects of various flavors of free public licenses (FPLs) and "to facilitate interoperability among sufficiently compatible license types". He explains that "Even if all the creative work you want to remix is licensed under a copyleft license, because those licenses are different licenses, you can't take creative work from one, and remix it in another . . . . We're going to fix this. Or at least, we're going to try." Andrew Raff of IPTAblog discusses Lessig's post and other FPL-related developments. Neil Squillante of TechnoLawyer Blog announces that BlawgWorld 2006: Capital of Big Ideas is now available free of charge to TechnoLawyer members (membership is also free of charge). The eBook comprises "best of" essays "designed to take you on a journey through 51 of the most influential legal blogs". As this blog is not included amongst those 51, the book seems to have some credibility. 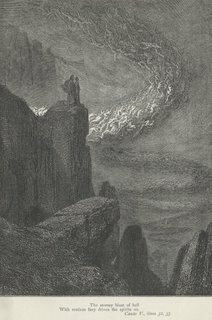 Nonetheless, the Editor of Blawg Review is skeptical in his/her/its review: "The concept of putting a previously published blog post, hand-picked by a writer selected by a publisher, on a pdf and making it available behind password registration on the publisher's website, seems overly self-interested." Kevin O'Keefe tends to agree: "It would be a heck of a lot better to put the posts in a blog, if anywhere." Finally, in his Illinois Trial Practice Weblog, Evan Schaeffer points us to a worthy effort at the Washington and Lee School of Law "to make law journals more accessible online". The Second Circle contains the souls of the lustful. In the National Review, columnist John Derbyshire recently wrote that it is a "very unfair truth that a woman's salad days are shorter than a man's -- really . . . only from about 15 to 20". "Federalist blogwench" Amber Taylor of the Prettier Than Napoleon blog discusses why Derbyshire's confession that he likes 'em young "skeeved me out". Svenson writes that, "I'm ready to cast my vote. I don't know who I'm voting for, but in most cases, I know who I'm voting against." 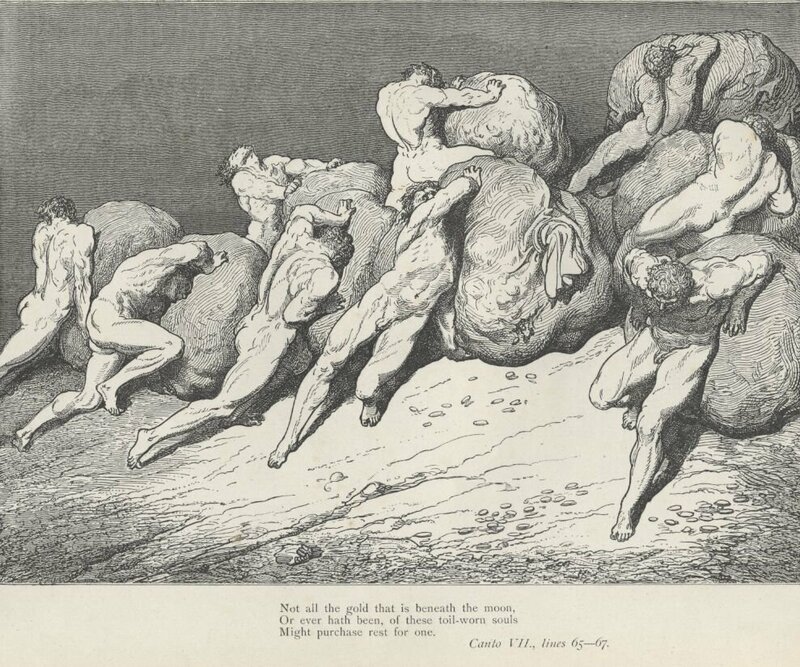 Those who feast away their lives find themselves face-down in the mud and gnawed by Cerberus for all eternity. Micha Ghertner at Catallarchy reports that Thanksgiving, that most gluttonous of holidays, has prompted some to reconsider the questionable immigration status of those who landed at Plymouth Rock. 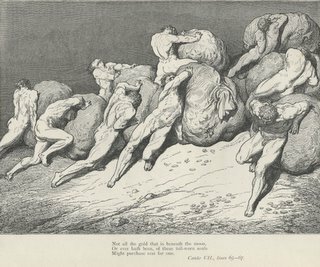 David Gulbransen of the Preaching to the Perverted blog caters to the gluttonous considering law school by boiling 1L down to a few bullet points. My own favorite is Torts: "Accidents happen, but someone's gonna have to pay for that." If only I'd had Torts explained as well to me a dozen years ago or so, I might be qualified to chase ambulances today. Stephen Albainy-Jenei of the Patent Baristas blog reports that "the tide has turned" for Pfizer's patent efforts relating to its $10 Billion-per-year Lipitor statin (cholesterol) drug: "On Nov. 23, 2005, the Examiner issued a Notice of Intent to Issue Ex Parte Re-Examination Certificate. Included in the allowed claims are 21 of the original claims, 13 amended claims and 73 newly presented claims!" Bruce MacEwen finds his soul divided this week between the First and Fourth Circles when he analyzes the results of the annual survey of AmLaw 200 managing partners. His verdict? "[W]hile the news is almost overwhelmingly good (at least if you're a partner in the AmLaw 200, and not a client of them), there's what may be a storm front on the distant horizon." One thumb up and one thumb down -- how lawyerly! It's par for the course here in this Circle, however, where the condemned push boulders in opposite directions for eternity. Anita Campbell of the Small Business Trends blog has our backs, though. She reassures us that small businesses still love us -- "A recent survey by the National Federation of Independent Businesses (NFIB) found that small business owners in the United States rely on their lawyers for help — and generally seem satisfied with the help they get." Rob Hyndman suspects that MacEwen's "storm front" may just blow over the heads of the smaller players, thanks to more nimble technology. Says Hyndman, "I simply can’t imagine what it would be like to be as tech-disabled as large enterprises now are - biglaw or big-anything else, really." The Dark Goddess of Replevin is pleased to report that her blog persona's credit limit has been bumped-up by $4,000. It is, as she puts it, "Not bad for an imaginary playmate." Professor Rebecca Tushnet of 43(b)log points out that life hasn't been so sweet for those without the strong credit rating of an imaginary persona. New York Attorney General Eliot Spitzer has secured an injunction against Applied Card Systems, Inc., a company which, it is alleged by the State, deceived consumers about how much credit would be available to them under the terms of their card agreements, trapped them in "a downward spiral of interest, late fees and over-limit penalties", and enforced their oppressive terms in a harassing and abusive manner. Professor Tushnet analyzes a preemption issue raised by the case. The Whisper Brand Strategy blog takes lawyers to task, telling them that they are "practicing branding negligence". Whisper argues that "To be successful, law firm branding, as is true for any professional services firm, must evolve beyond a mindset that thinks short and snappy by itself is branding." In all fairness, however, it seems that there's only so much a firm can do to distinguish itself in the marketplace. Will Hornsby examines the Supreme Court of Florida's recent decision to sanction lawyers for using images of pit bulls in their advertising and wonders, "Are Cute Puppies Okay?" Hornsby's post also pulls together the uniformly negative reaction to the case from across the blawgosphere and from "civilian" editorialists. Norm Pattis of the Crime & Federalism blog takes the profession (or at least our brethren in New York) to task for their miserly ways. A modest pro bono commitment was requested from larger Manhattan firms, but "[o]nly 30 of the 55 firms approached signed on, meaning that more than two dozen firms would rather grab cash than do public service". Uh, I gave at the office? On a completely unrelated note, today is International Volunteer Day. The Appelate Law & Practice blog points out some lazy jurisprudence in the Sixth Circuit. Judge Boggs first criticizes a probable cause standard which relies upon an arbitrary percentage chance of success and then establishes a new standard which does essentially the same thing. 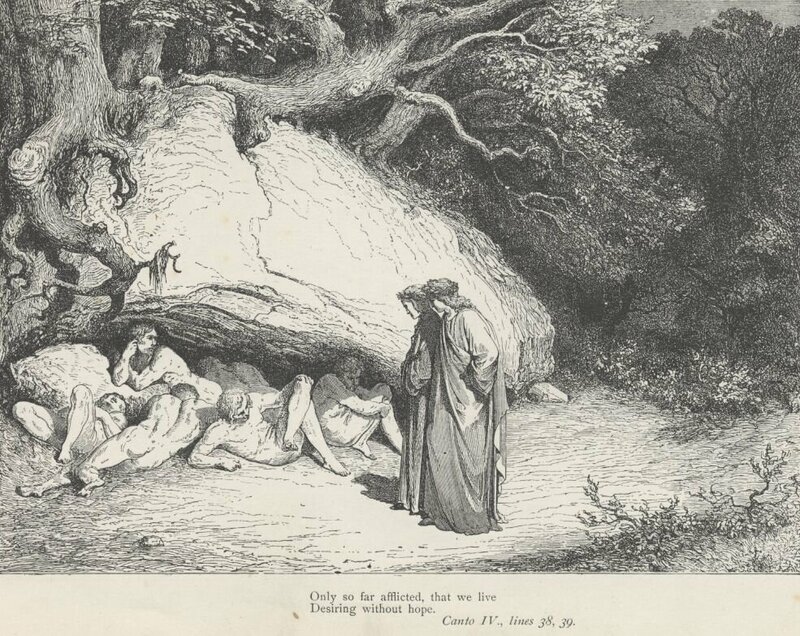 The lazy and sullen are condemned to the Fifth Circle, which means that the Judge will spend eternity (or at least this week's Blawg Review) surrounded by those who died as teenagers. How lazy is the Supreme Court? Well, it depends who you ask. Justin Mazzone, guest blogging at the Concurring Opinions blog, notes that "Last term, the Supreme Court issued opinions in just 74 cases. That’s pretty pathetic." He wants to know "Why does the Supreme Court accomplish so little?" He has a few words of advice for the new Chief Justice: "double the number of cases the Court decides (it decided 123 the term Roberts clerked for Rehnquist), halve the length of opinions, make unanimity the goal, and discourage separate concurrences." Professor Orin Kerr of the Volokh Conspiracy blog comes to the Court's defense -- sort of -- and doesn't agree that more is better: "I think it's probably wrong to think that more Supreme Court decisions means more settled law. If anything, I think the opposite is probably true: lots of new Supreme Court cases in a field probably tends to unsettle the law rather than settle it." So, how lazy is the Supreme Court? It's so lazy that even its marble façade is falling down on the job! Thank you, I'll be here all week! Remember to tip your editors! Along with the lazy and sullen, this circle contains those who are combative and intemperate -- pretty much every litigator, it would seem. If this seems like a strange mixture, perhaps it's just divine wisdom -- it would be difficult to find two groups could annoy one another more consistently when thrown together. 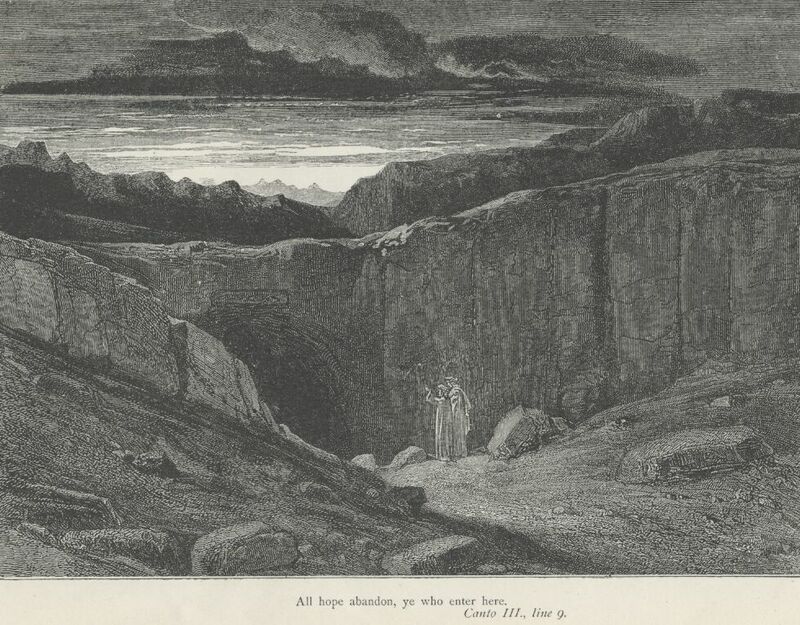 Nevertheless, they are somewhat separated; the wrathful fight one another whilst partially submerged in the River Styx, whereas the slothful are completely underwater, like stock options. There was a good deal of discussion this week concerning Seventh Circuit Judge Posner's rejection of attorney fees claimed by Budget Rent a Car in its ongoing litigation with Consolidated Equity: Ted Frank at PointofLaw.com Forum led the way by criticizing the Seventh Circuit, which rejected Budget's claimed fees as "exorbitant": "The opinion exhibits a fundamental problem with much of the judiciary: a complete lack of understanding of how much litigation actually costs clients." Frank's follow-on post pulls together several other blogged opinions on the decision, including one by Will Baude, guest blogging at PrawfsBlawg. The dispute centers around the amount of time spent by junior associates to prepare routine filings; Baude suggests that "The reason to give this work to a younger lawyer who will take longer is that this is how he or she gets experience and becomes a better lawyer. But Posner, I think, wonders why Budget's lawyers should be doing this on somebody else's dime." J. Craig Williams of the May It Please The Court blog is just feeling generally ornery about rumors that class action suits will be filed against Coca-Cola concerning its high-calorie sodas and their alleged contribution to childhood obesity. Williams concludes that "Maybe we need long physical education classes and more sports in school, and less time in the courtroom." The chief type of heresy is questioning the established church . . . questioning the established church and seeking to subvert the status quo with new technology. 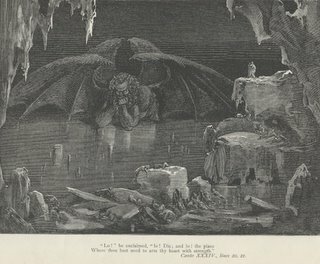 The two types of heresy are questioning the established church and seeking to subvert the status quo with new technology. And ruthless efficiency. Amongst the types of heresy are such elements as . . . oh, nevermind; I'll come in again. 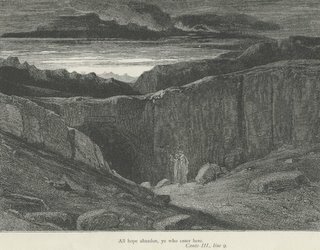 David Giacalone of the f/k/a . . . . blog is questioning the established church this week. Giacalone notes the Vatican's recent expansion of its ban on homosexuals in the priesthood and wonders where this leaves Catholic Legal Theory: "I submit that the Vatican's Instruction on gay priests tells us a lot about how the Church views 'human flourishing,' 'authentic freedom,' and 'the nature of the human person.' And, no matter how it is viewed within the Church's hierarchy and membership, what it says should be ignored by American law schools, its legal scholars and broader legal community." Welcome to the Sixth Circle, David! The WiredGC discusses Web 2.0 technologies and their potential to disrupt the status quo for handling and providing legal information; it also provides a succinct description of Web 2.0 for those of you who just said, "Huh?" The WiredGC posits that "This could have all sorts of ramifications as to what law firms are really selling (information or insight), how they are organized (partner/associate) and how they are valued (finders over minders over grinders). It may also mean that a corporate legal department lets more work be done by clients themselves." 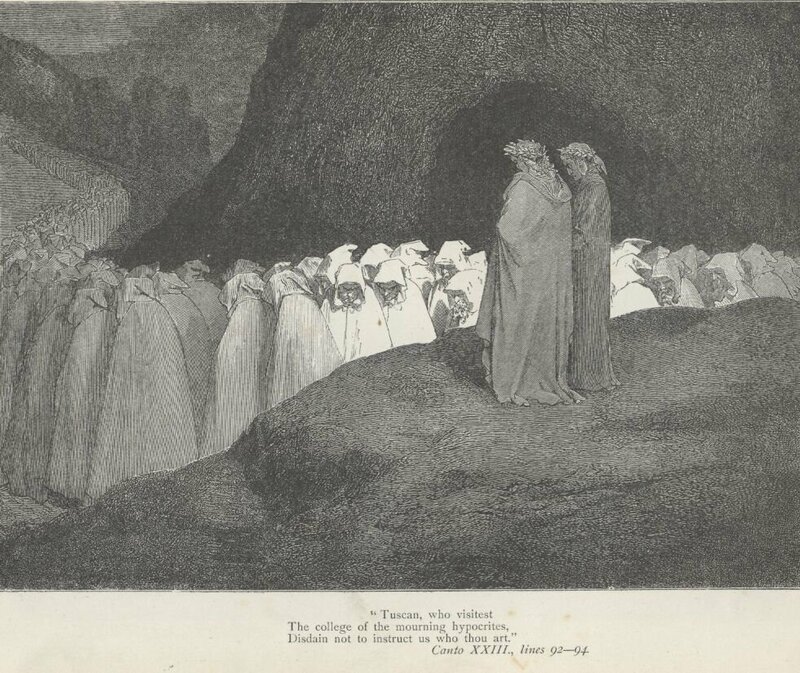 Dante viewed most forms of violence as essentially equivalent to one another; in the Seventh Circle of Inferno are the souls of a variety of "violent" people sent here without much regard to the objects of their violence -- be these other people, themselves, God, nature, or art. On Friday, Holly Manges Jones of the University of Pittsburgh School of Law's Jurist reported the execution of the 1,000th person since capital punishment was reinstated in 1976. Kenneth Lee Boyd was put to death by the State of North Carolina for the killings of his wife and father-in-law; Boyd did not deny his crimes. Also on Friday, The Legal Reader blog reported another execution half a world away in Singapore. Nguyen Tuong Van, an Australian, had been convicted of drug trafficking; although his guilt does not appear to have been questioned by those in his homeland, his looming execution date had raised diplomatic tensions between Australia and Singapore. Scott Hansen of the Grits for Breakfast blog argues that probable injustice in the Cantu case might have been averted had corroboration for the eyewitness testimony been required. 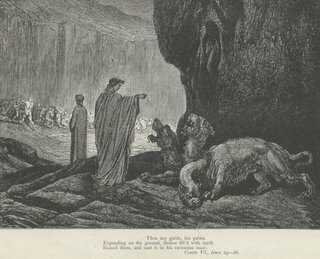 Hansen points out that several biblical passages, in the Books of Numbers, Leviticus, Matthew, 2 Corinthians, and 1 Timothy, establish a Christian tradition requiring such corroboration in criminal matters generally and for capital crimes specifically; at one time, American criminal statutes were modified to conform to these biblical standards. The blawgosphere this week also offered examples of violence to the arts: Kevin A. Thompson of the Cyberlaw Central blog notes a case of RSS hijacking and concludes that "alleging copyright infringement should work, at least for purposes of a cease and desist letter". Thompson points us to a post from Colette Vogele, who explains the mechanics of RSS hijacking. In a comment to Thompson's post, Rob Hyndman informs us that "The first known case of podcast theft has occurred". Opinionista seems to be doing some violence to herself in her quest to put in enough "Face Time" to satisfy her law firm overlords: "I've made a concentrated effort to remove myself from the game, but still I can't help feeling like I've landed on Park Place and gone broke every time I pass a partner at 7 p.m. on my way to the elevator. In the battle between logical reason and blind herd-adherence, it's clear which is winning." In response, The Listless Lawyer tells her that "We make our own prisons" and advises her that "life really is better out here in the Midwest". Finally, when it comes to the violence we do to ourselves, The Greatest American Lawyer worries about something else -- "the Destructive Six-Minute Increment": "I have said this before and I will say it again hourly billing is just not healthy. It is destructive to the lawyers who are subjected to it." The Eighth Circle is subdivided into a number of "bolgias" or ditches, each specific to a particular type of fraudulent or malicious sinner. The first of these contains the seducers and panders, those smooth operators who cajole others into doing their bidding, usually against those others' own best interests. Professor Gordon Smith of the Conglomerate blog points out that, for many entrepreneurs, franchising is a nightmare: "The perception that a franchised business is a 'sure thing' is enhanced by the disclosure that accompanies franchise sales . . . . The law reporters bear testimony of failed dreams. Franchise disputes are common, despite elaborate contracts." 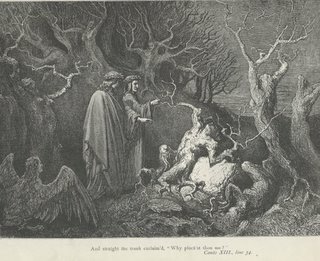 In the First Bolgia, Dante encountered Jason. 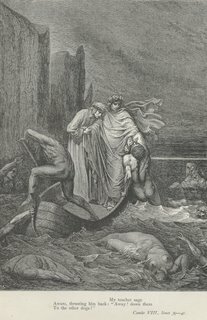 If Jason were around today, he probably wouldn't bother with the voyage to Colchis; he would have just franchised Argos and rolled the proceeds into an offshore Golden Fleece holding company. Dennis Kennedy, in a reposted article, offers us seven quick negotiating tips from another smooth talker, Columbo. There must have been a method to his madness for him to have successfully solved so many complex cases in just an hour or two, and now Kennedy has discovered it for our benefit. The Fifth Bolgia contains corrupt politicians. The White Collar Crime Prof Blog discusses the ramifications of prosecuting campaign contributions as bribes and concludes that prosecutors going this route would have a tough row to hoe: "If prosecutors decide to pursue charges against members of Congress, the standard for proving a bribe will be high if the payments are identified as campaign contributions." Professor Bainbridge sheds a little light on legal academia's "dirty little secret" -- that, despite their lip service to "diversity", elite law schools have done a poor job of diversifying the points-of-view within their ranks. Two articles to which the Professor links suggest that this may be slowly changing, but for now, those elite schools find themselves deposited into the Sixth Bolgia along with the other hypocrites. Academic hiring also drew the attention of Jason Mazzone, another divided soul this week, splits his time between the Fifth Circle and the Eighth. He points to another aspect of academic hiring and reports that "Nepotism is at work in the legal academy": "Do good work, we tell ourselves and we tell our students, and you will go far. There are special reasons to question nepotism in the legal academy." As we tiptoe through the Eighth Circle of Hell this week, our last stop is the Eighth Bolgia, final destination for fraudulent advisors and evil counsellors. Our first example this week is provided by Tom McKenna at the CrimLaw blog. McKenna passes along the story of a Tennessee attorney who found himself on the wrong end of a perjury prosecution after advising his client to lie under oath, and putting that advice in writing in an e-mail. The attorney wrote, in part, that "I've never seen them charge anyone with perjury, and everybody lies in criminal cases". McKenna's assessment? "Ouch." As another eminent Tennesseean might say, "Indeed." Last but certainly not least in this circle of Hell is a man who is perhaps the archetype of the "evil counsellor" -- Anonymous Lawyer. This week alone, Anonymous has solicited suggestions from his readers on how to best torture his associates, he's run over a cat ("People should control their pets better. "), and he's lamented that none of his associates failed this past summer's bar exam. In the Ninth Circle are the souls of traitors -- to their families, their countries, their friends, and their lords and benefactors. This week, Lyle Denniston of SCOTUSblog reported on the latest developments in the prosecution of terrorism suspect José Padilla, an alleged-for-now traitor to his country: "In a surprise order, responding to a Department motion last week that Padilla's lawyers had not opposed, the Circuit Court ordered new briefing from both sides on whether it should vacate its Sept. 9 ruling upholding Padilla's detention as an 'enemy combatant.' If the Court were to do that, it would remove a major precedent in favor of presidential power during the war on terrorism." Thus ends the thirty-fifth edition of Blawg Review. For those of you who wondered, the engravings which accompanied each of the sections of this week's issue are by Gustave Doré and are from the illustrated edition of The Divine Comedy published in the 19th Century. A larger version of each image is available by clicking on the image. 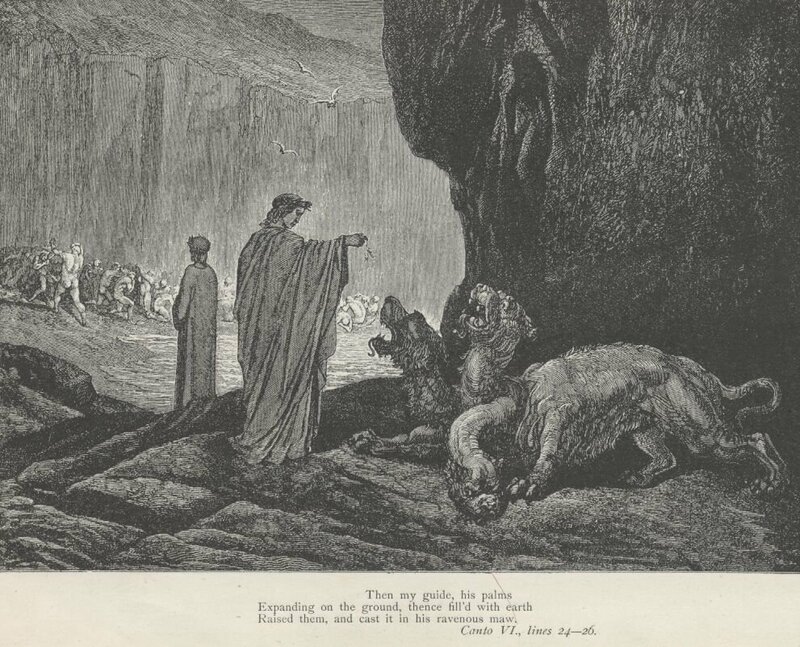 The complete illustrated edition (translated by Henry Francis Cary) and Henry Wadsworth Longfellow's Translation (not illustrated), from which I quoted, are both available online through Project Gutenberg. In closing, I'd like to offer my gratitude to the editors, my own Virgils this week: Kevin J. Heller of Tech Law Advisor, Evan Schaeffer of Evan Schaeffer's Legal Underground, Mike Cernovich of Crime & Federalism, and the anonymous Editor 'n' Chef of, well, everywhere and nowhere. Next week, E.L. Eversman will lead us toward Paradiso when the AutoMuse blog hosts the thirty-sixth issue of Blawg Review. This is superb. If I didn't fear hurting the feelings of previous hosts (including me), I'd say this was the best one yet. This was a really great Blawg Review - it must have taken you a long time to put it together and it covered such a wide range. I'm not a regular reader of your site but I will be now. #35 deserves much praise. Two thumbs up. Absolutely phenomenal! Thanks for a great read and an informative read as well -- I felt like I was back in freshman lit class! Way to go! This was excellent. Thank you Colin. However, one point. You state "it seems that there's only so much a firm can do to distinguish itself in the marketplace" in response to the Branding Lawyers piece at Whisper. Respectfully, a head in the sand view. For example, take a look at the example included in the piece. And, consider this, apparently the Whisper CEO is a former prosecutor/litigator/general counsel. A good trial lawyer is the ultimate brand strategist, with a very select target audience of 12 people in a jury box. We need only turn those same skills upon our own firms to develop distinct brands.